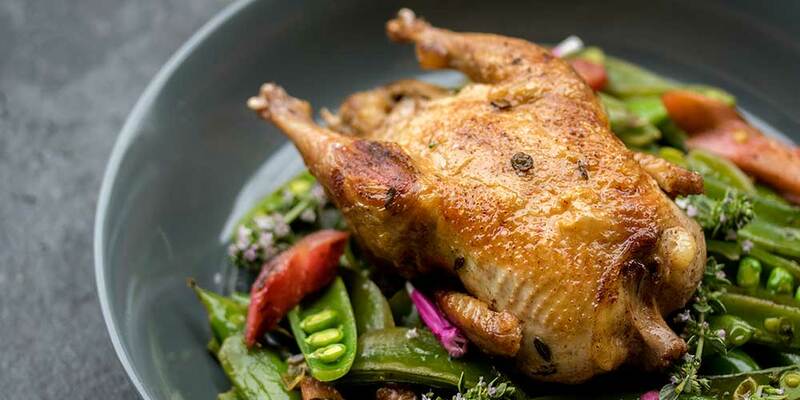 Partridges are beautiful single-serving birds, each about the size of a large russet potato. They have a mild, slightly nutty flavor that we’ve accentuated here (while keeping them moist) by basting them with brown butter. Rhubarb isn’t just for pies, compotes, and jams. Here we’ve sauteed it with sugar snap peas and thyme into an exciting side that cuts the richness of the butter. Use a cleaver to remove the heads (at the neck), feet (at the joint that ends the drumstick) and wing tips. Lightly salt the partridges & put them in a bowl in the bottom of the fridge, uncovered. Oil a frying pan or skillet with the canola oil & get it hot over medium-high heat. Add the butter & thyme sprigs, swirling the butter to melt it in. Reduce the heat to medium, and add the partridges. Baste the partridges with the butter, turning them frequently, until they’re browned on all sides. Flip the partridges on their backs & continue to cook them until the breast meat reaches an internal temperature of 160°F. Remove the partridges from the pan to rest, loosely covered with foil. Remove the thyme from the butter & discard it. Pour off & discard half of the fat in the pan. Increase the heat to Medium High. Add the rhubarb along with a half tsp of salt and honey. Saute for 2 minutes, stirring frequently. Add the snap peas to the pan, season with black pepper and the thyme leaves. Continue to cook until the rhubarb and peas are cooked to your liking. 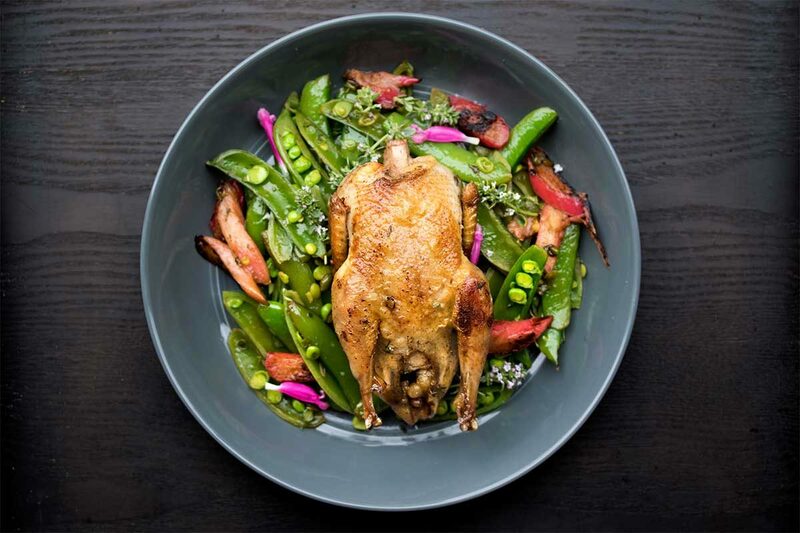 Serve the partridges atop the rhubarb & peas, optionally garnished with thyme blossoms and/or sage monet pink blossoms.